Operation Happy Bunny – An Easter bunny hunt near you. Operation Happy Bunny is an idea inspired by the “pay it forward” notion. Also another lovely arts project which encouraged people to leave their favourite paperback on a bench for a complete stranger to enjoy. This Easter, Rufus in his own small way wanted to spread a little “happy”. Consequently for the last two weeks Rufus has been crazy busy preparing for Operation Happy Bunny (and possibly maybe snaffling chocolate to sustain his energy levels). 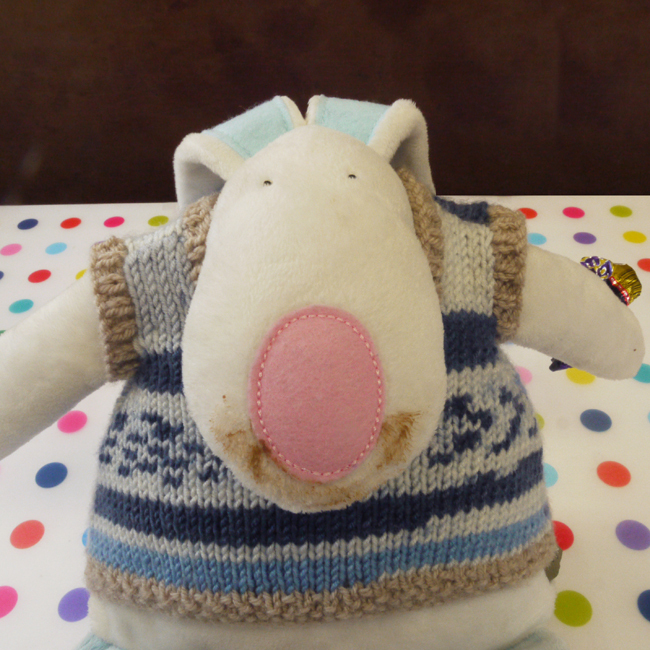 Through the wonders of Facebook, Rufus’ Mummy friends have gamely volunteered to help 200 limited edition Rufus & Rubie Rabbits make their way around the UK in time for the Easter weekend. As a result, from Good Friday to Easter Monday a bunny could be discovered sitting on a bench in a park or play area or beach near you. If you should be lucky enough to spot a bunny, please scoop them up and give them a home. They are fully house trained, love cuddles and have a particular fondness for carrot cake. Best of all they are forever yours if you find them first. Of the 200 Rufus Rabbits taking part in this project we have asked two to wait patiently on Rufus’ Facebook & Instagram pages. Therefore those who might be too small to go on a bunny hunt can still play along! If you’d like to join in the fun virtually then follow Rufus’ pages from Good Friday to Easter Monday and keep ’em peeled to comment on the posts. Finally, here is a list of the areas where you could very well find a happy bunny. Sorry we can’t be more specific at this time but we will update as and when we know more. and finally, wait for it, in addition to all of these wonderful places … Hong Kong & Dublin, I know, how cool, right!!!! If you have the time, please do share this project with your friends to help improve the odds on all the bunnies finding homes. If by chance you are super lucky to find one we’d love to know where and which number bunny you have found. Just found one!! He was sitting on a bench watching the pigs at Quarr abbey on the Isle of Wight. My 6 year old milly was delighted and promises to give him a good home. Thank you so much. Made our day!! We found one at Quarr Abbey too; hiding in the wildlife hide amongst the trees! Happy Easter from Rubie Rabbit and her new family! Thank you so much, my son found #185 this morning on Chaddesden park in Derby and brought it home for his little sister. Her eyes lit up and he is now sat all cosy on her bed waiting to give extra cuddles when she goes to sleep. My son found one at Chatsworth farm.park and was delighted!